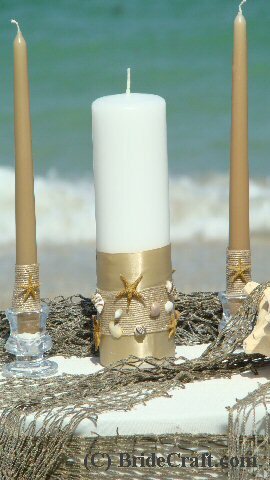 Decorate a Beach Unity Candle for Your Beach Wedding! 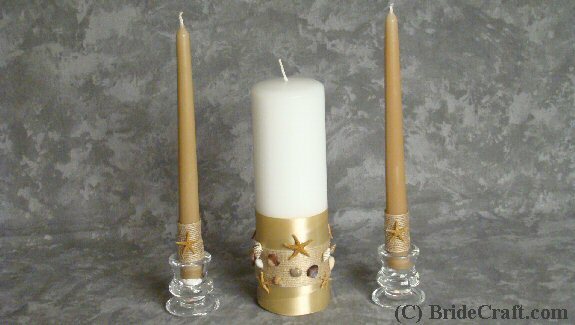 Want to tie your beach themed wedding into your wedding ceremony with a beach unity candle set? Can't afford an expensive custom set? Then use a little creativity and make your own! 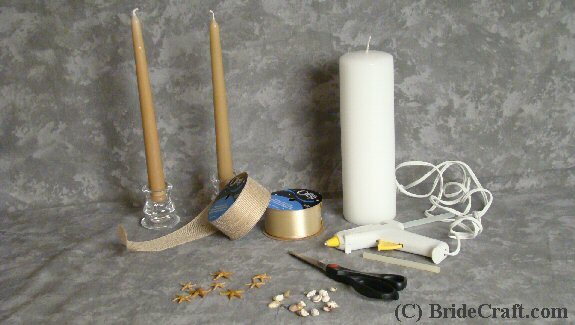 Below you will find a step by step tutorial showing you how to create this candle set. Pros: Very easy to recreate and customize. Custrom candles can be expensive…and this one, is not. Cons: A unity candle on the beach itself will be almost impossible to light. So it's best used when you're bringing the beach indoors. Another drawback might be that if not stored and transported properly, the delicate shells and starfish could be damaged. 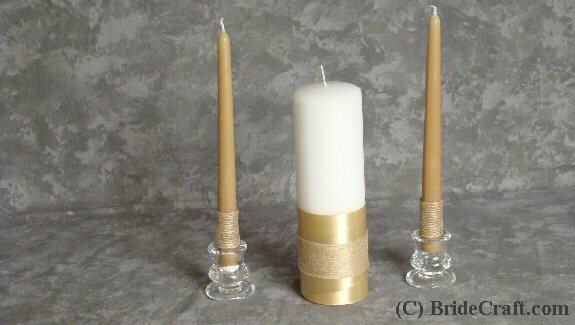 Step 1: You will need 1 pillar candle, 2 taper candles. 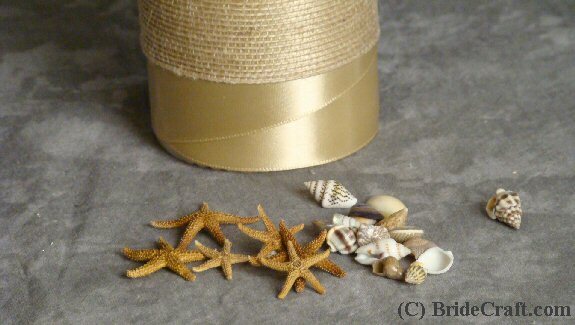 “sand” colored satin ribbon, burlap ribbon, a glue gun and sticks, scissors and a selection of small shells and starfish. 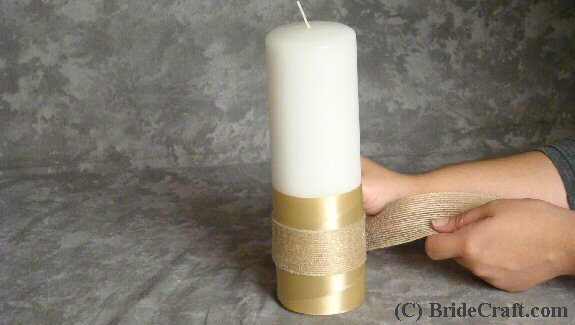 Step 2: Roll out your satin ribbon against the candle, giving is a rough measurement. At the start of the ribbon, drag a line of hot glue out. 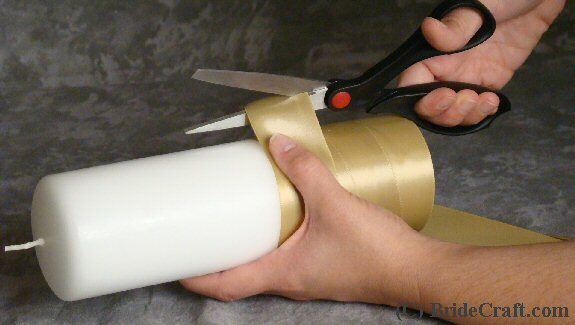 Wrap the ribbon around so that it circles the candle and adheres to the glue. 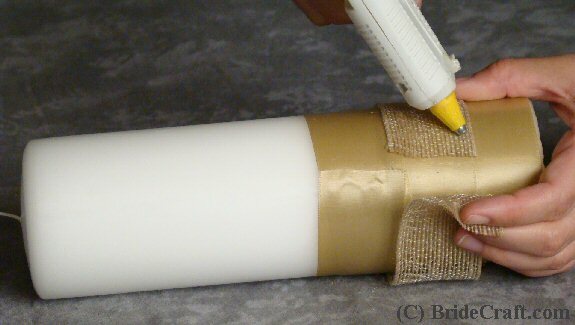 Begin wrapping the candle. Step 3: When you are satisfied with the length of the ribbon, trim the edge as straight as possible. 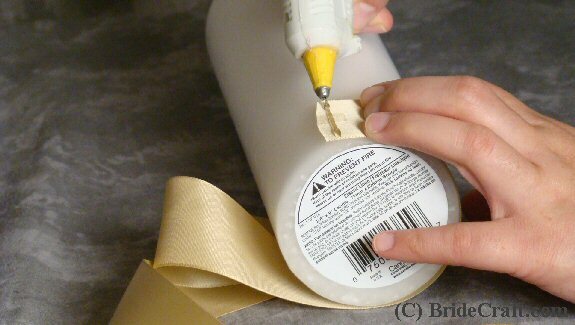 Secure the edge to the rest of the ribbon with another line of glue. Step 4: Create a “belt” of ribbon with the burlap roughly in the center of the satin ribbon wrap. Measure and cut the burlap ribbon to overlap ever so slightly. Step 5: Glue the burlap ribbon “belt” to itself. Step 6: Create a burlap wrap for each taper, to match the pillar. You should have something like this. 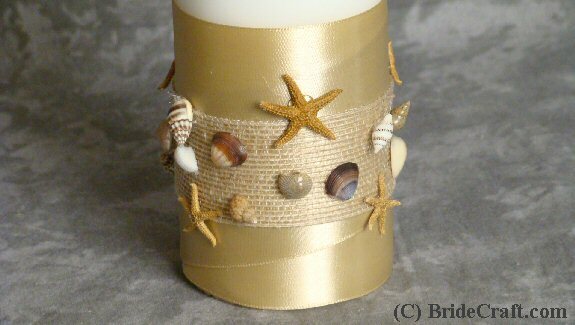 Step 7: Select sea shells to embellish your beach unity candle. Step 8: Glue the star fish to the edges of the burlap. 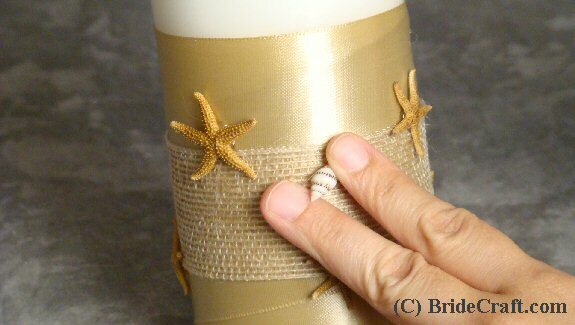 Step 9: Glue your sea shells to the burlap ribbon. Do not make them completely symmetrical (unless that’s the look you’re going for! ), but kind of stagger them as shown here. Step 10: You should have something like this. 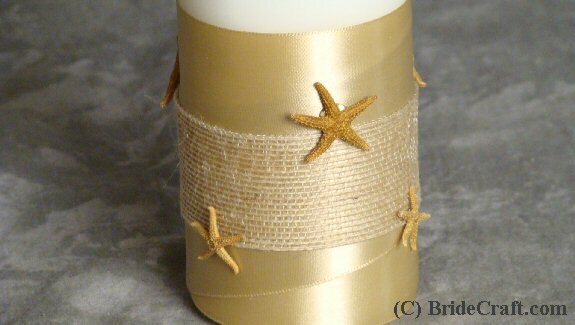 Step 11: Attach a delicate starfish to each taper, and your set is complete, as easy as that! Store in a dry place away from heat (…maybe the candle won’t melt all the way, but who wants a bent out of shape candle? Be careful!). Also, when transporting, tissue paper or pillow stuffing will help protect all of those fragile shells. Enjoy your beach unity candle!